I cant remember having seen such a list ? But obviously many brands use one type of box only, and others can offer different "heads" on their foils. The boards though, are typically always one system, but which ? Might be different on different boards and age of one brand, but could we make a list ? Last edited by Peter_Frank on Sat Aug 13, 2016 12:11 pm, edited 2 times in total. Top foil manufacturers like Taaroa and Levitaz will put a Tuttle, or KF Box or ProBox head on their masts for you. It is a simple manufacturing step done after the mast is made. We all wish there was a standard. In North America the Tuttle seems very common but we shall see which wins. Remember it is not about which box is best from an engineering point of view, it is who gets the biggest market acceptance. Plate mounts are virtually never used for high performance but do get used with the thin boards. I was looking into F-one board, and wondered which other company masts would fit the board. Guess we are going through the VHS/Betamax growing pain - to be replaced by CDs, followed by internet! cglazier wrote: Top foil manufacturers like Taaroa and Levitaz will put a Tuttle, or KF Box or ProBox head on their masts for you. It is a simple manufacturing step done after the mast is made. So true, but only to some extent. If it was from an engineering point, there would only be two, namely the ProBox for racing and the KFBox for other and thinner boards - but the plate is still udeful when it has to be easy to mount on "anything" so also good, but it could be obtained with an adapter head also. These two because of the conical sides and the screws that are in line with the mast and not angled like on the Deep and Std Tuttle, so the latter is an ancient design from the tail of windsurf boards where the angle somewhat followed the tail tapering out. But a standard will not be an option overall, as the ProBox is way too big for allround boards, but suits raceboards. 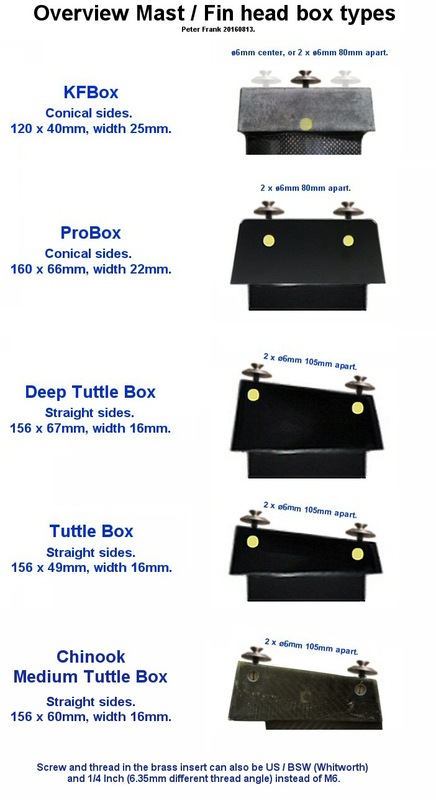 The KFBox only needs 4cm thick boards, but 2cm also an option. Many will prefer the ease of drilling holes and mounting a plate on existing hard-core boards, and easier to make adjustable or move, and can be used on every board, besides a good load distribution where boxes can be tough to build strong into the boards. Changed a bit since the first post, as I agree, the plate has a good load distribution. Last edited by Peter_Frank on Sun Aug 07, 2016 11:33 am, edited 3 times in total. Last edited by Peter_Frank on Sun Aug 07, 2016 12:02 pm, edited 4 times in total. and also agree with your last post. But also the plate in my eyes is still a good systems as with rails with a changeable position and also for higher performance (think also some worldcuppers still use it). From a guy who repairs boards I heard there are many issues with all box systems, less with with plates with its better load allocation. I think the most beautiful, engineered solution is the elongated KFBox used by the boards Ketos sells. There is also a deep KF-box. It's used on the new Fone race foil. Zeeko foil mast mounting plate has holes for 85 x 160mm and 90 x 165mm positionings (oval holes).. So if you'd like to use your Zeeko board with the foils where mast mounting plate holes are positioned as 90 x 165mm only, you have to drill new holes. TKF has similar kind of adapter plate like Zeeko foil part has; there are holes for 85 x 160mm and 90 x 165m positionings. TKF has KFBOX adapter with 2 (M8) screws also. pstkk wrote: There is also a deep KF-box. It's used on the new Fone race foil. Just saw this yes, so should be same box but higher right ? Assume it must be two 6mm screws 80mm apart box 120x25x??? what height ? Anyone who can supply with dimensions ? In order to be able to use a Std KFBox in a deep box, I assume it is made higher and nothing else, to support more load for racing and windfoiling right ? Otherwise they would have chosen a ProBox I assume.